Apple iPad 2 16GB Wi-Fi,Black iOS 9. - Apple iPad 2 16GB WiFi, Black Silver. All iPad's are fully tested and in perfect working order. Need an Apple box for a gift etc?. Link below. FREE 12 Month Warranty. Apple iPad mini 16GB WiFi.Black. - Apple iPad mini 16GB WiFi, Black. All iPad's are fully tested and in perfect working order. Need an Apple box for a gift etc?. Link below. Overall I'd say Grade A- (Excellent condition). CHEAPEST SAMSUNG SIM TABLET FOR VOICE CALL & WHATSAPP WIFI. For a smooth performance, this Samsung tablet is equipped with a 1.2GHz quad-core processor. Weighing only 0.5 kg (1.074 lb.). this Samsung tablet is very convenient to carry. All iPad's are fully tested and in perfect working order. Need an Apple box for a gift etc?. Link below. Overall I'd say Grade C (Average Condition). Fully working. FREE 12 Month Warranty. 12 Month Warranty. Weight Wi-Fi & Cellular Model: 662 g (1.46 lb). Important Information. Fingerprint-resistant oleophobic coating. 2048 x 1536-pixel resolution at 264 ppi. Bookmark Us. 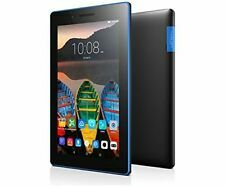 Type: Tablet 2G Network: GSM 850 / 900 / 1800 / 1900 3G Network: HSDPA 850 / 900 / 1900 / 2100 4G Network: LTE 800 / 850 / 900 / 1800 / 2100 / 2600 Sim-type: Micro-Sim Dimensions: 243.4 x 176.4 x 8 mm Weight: 487 g Displaysize: 10.1" 1280 x 800 pixel Displaytype: TFT capacitive touchscreen, 16M colors Memory int. : 16 GB Card slot: yes up to 64 GB Keypad: full touch Datatransfer: x Connectivity: Bluetooth, Wi-Fi, Wi-Fi Direct, dual-band Features: GPS with GLONASS CPU: Quad-core 1.2 GHz Camera: 3.15 MP Oper.System: Android. 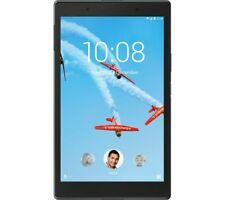 HERE WE HAVE FOR SALE AN EX DISPLAY AND IN EXCELLENT/MINT CONDITON A LENOVO YOGA TAB 3 YT3-X50F WIFI 16GB IN SLATE BLACK COLOUR. Box contents: Lenovo YOGA Tab 3 10.1"- AC power dapter. Type: Tablet. Battery life: Up to 18 hours. Apple iPad 2 16GB Black WiFi. The second generation of Apple's venerable tablet - iPad 2 - improves on its predecessor in both design and hardware. You’re getting a great device at a great price! As well as a great value phone you will also receive the following. FACTORY UNLOCKED. Afully working iPad. Excellent condition used iPad with very little or no signs of use, top quality example. All iPad's are fully tested and in perfect working order. Need an Apple box for a gift etc?. Apple iPad 3rd Gen. 16GB, Wi-Fi, 9.7in - Black MC705B/A. 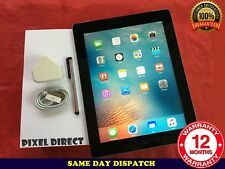 In good used condition, very clean for its age and comes with Griffin tough case, usb camera connector and charge cable..
Apple iPad mini 16GB Wi-Fi Cellular (3G/4G)Black. - Apple iPad mini 16GB WiFi Cellular Black. Afully working iPad. All iPad's are fully tested and in perfect working order. Need an Apple box for a gift etc?. Samsung Galaxy Tab A - SMT580 10.1" WiFi 16GB 2GB Ram 1.6Ghz Octa Core 8MP Black. EX DISPLAY UNITS. COLOUR : BLACK. Sony Xperia Z2 SGP521 16GB, Wi-Fi 4G (02), 10.1in tablet - Black comes with red faux leather case with has protected edges ... it also has a screen guard which was applied from minute one. Condition is used - in excellent condition. comes with genuine charger. I don't have the original box I'm afraid. The tablet will be packed very well. This device is unlocked. please make sure this is suitable for your needs and compatible with your existing equipment before purchase. Dispatched with Royal Mail 1st Class.